At Action for Sustainable Development, we are always looking for ways to ensure accountability at the High Level Political Forum. So for 2019 we have gathered the views of civil society members and partners through an extensive survey- this report shares key priorities from civil society partners and their recommendations on ways to improve the process of follow up and review. We have launched a new version of our civil society national reporting template – the People’s Scorecard! This template sets out a clear path for national civil society coalitions to consider key areas for a national report that goes beyond simply a response to government, instead we aim to support you to provide an independent analysis built from the insights and experiences of communities around the country to be presented in the form of a People’s Scorecard. 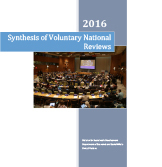 This work builds on the earlier template produced by Action for Sustainable Development for a ‘Civil Society Report’ undertaken in parallel to the official Voluntary National Review process. At this stage, as we reach the end of the first four year cycle of review, we aim to support you to go further than earlier templates, setting out the ways that civil society organisations may choose to monitor delivery themselves as well as respond to government reviews. As in the last three years at the UN High Level Political Forum on Sustainable Development, Action for Sustainable Development convened a two day workshop with over 150 civil society representatives to share key priorities and build joint action. This year the keynote opening speech was delivered by Mary Robinson, former President of Ireland and fomer UN High Commissioner for Human Rights. Parallel reports by civil society aim to identify which mechanisms are in place for government engagement with civil society, local governments, and other stakeholders in realising the Sustainable Development Goals at a national and international level. They also provide some useful recommendations to governments on ways to enhance implementation. You can use our guiding questions Report Template_2018 to prepare a summary in your country and find the full list on our HLPF pages. In collaboration with the NGO Major Group, Action for Sustainable Development ran a series of webinars at the end of June 2018 on ‘How to Engage with the HLPF’. The webinars provide an overview of the HLPF process and how you can engage through the recognised Major Groups and other Stakeholders to have your voice heard at the UN! 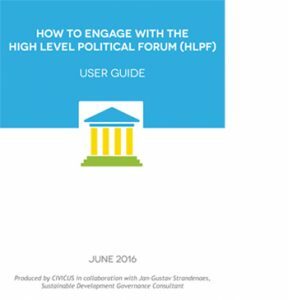 In order to ensure members are prepared for the High-Level Political Forum, Action for Sustainable Development prepared a user guide to engage in the process both in person and remotely. 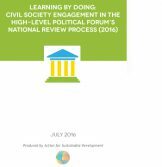 How can civil society most effectively engage with this process? How does the UN enable voices to be heard from the people who are most directly affected by these policies? This user guide will answer these and other questions about the engagement in this critical institution and its governance of the Sustainable Development Goals. Action for Sustainable Development worked in partnership with a range of key civil society partners, such as the International Forum of Platforms (IFP), the Canadian Council for International Cooperation (CCIC), BOND (UK), Together 2030, Cafod and WWF, to produce a summary report on all the Voluntary National Reviews in 2017 and set out main recommendations on how to improve shared learning between countries and go further in ensuring a truly transformative agenda. Countries reported on the achievement of the SDGs from their national perspectives, including a consideration of their national priorities and approaches, and outlined how they have included the SDGs into national development plans and strategies. They provided information on the context in which they are implementing the 2030 Agenda and the SDGs and particularly the overarching challenges they face. These included high levels of poverty and inequality; fragile economies; dependence on natural resources and agriculture and facing the effects of a prolonged fall in commodity prices; epidemics and their aftermath; high unemployment, and in particular youth unemployment; conflict and post-conflict situations vulnerability to disasters and the consequences of recent disasters; vulnerability to climate change; and financial and institutional shortcomings. The High Level Political Forum (HLPF) provides the pre-eminent space for dialogue with the UN system on sustainable development. 2016 was the first year of implementation of the 2030 Sustainable Development Agenda and in this context 22 countries have volunteered to undertake national reviews to be presented at the HLPF. As this is the first review of its kind, it is to be hoped that this process can set a benchmark for future reviews, so that the aspirations of the 2030 Agenda are delivered in a truly just and sustainable way. There are major questions remaining on implementation, monitoring and accountability of this agenda; this paper aims to provide some initial reflections on the engagement with civil society in the countries under review and to set out some recommendations on how this engagement can be further strengthened. Over March-June 2016, the Action for Sustainable Development platform collected summaries from national civil society organizations (CSOs) within the 22 countries that have volunteered to be reviewed by the High Level Political Forum. Through the comparison of these summaries, general observations can be made to link the inclusion of civil society in the SDG process, and provide an analysis of the degree of depth and breadth found in national SDG proposals. At the heart of the goals is a commitment to ensure that ‘no one is left behind’ and that no goal is considered met unless met for all. That’s because, although we have witnessed huge progress in the fight against poverty and injustice, too many people – the most impoverished, those that are excluded, disadvantaged and at risk of violence and discrimination – still face terrible inequalities when it comes to accessing resources and rights. The world must focus on reaching these groups and ensuring they can make their voices heard if we are to achieve a better world for all. In 2016 and 2017, the Leave No One Behind partnership, led by CIVICUS, Development Initiatives and Project Everyone convened 30 national dialogues with a wide range of national coalitions to identify which groups of people and communities are most often left behind and how they can be supported to engage with the Sustainable Development Goals. You can download: an Overview of the Leave No One Behind Partnership; the Presentation at HLPF- NY July17 and the full report Leave No One Behind: Delivering on the 2030 Agenda Promise.